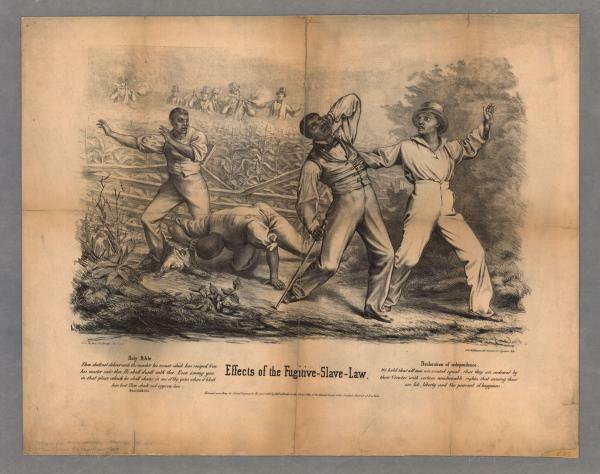 This image portrays what life would have been like for blacks in America after the Fugitive Slave Act was passed. It shows four blacks being shot by white men as they tried to escape their capture. What is important to note is that it is unknown if these black men were free or fugitives. To the white men, it wouldn’t have mattered, as they would have attempted to shoot and capture them anyway. (2) Groce, George C. and David H. Wallace, The New York Historical Society’s Dictionary of Artists in America, 1564-1860 (New Haven: Yale University Press, 1957), 361. Dimensions: 33.1 x 43.8 cm.